A scene from the worst job interview ever. You should be proud of me: I’m pretty sure that I wrote an entire column about Game of Thrones without making a stupid pun! I’ve been playing the Telltale series and enjoying it. Overall the games have been faithful to the themes built by the show and the books. Episode 2 felt a little uneven, but I think it is mostly a case of trying to figure out exactly to meaningfully convey drama and consequences. The opening scene illustrates this: five minutes in you’re faced with several consecutive QTE sequences and of you mess up, you get a game over screen. I (and I assume everyone else) comes to these types of games for the story and character interactions, so it’s frustrating when you’re pulled out of the moment right when you’re trying to get immersed in the story. I see why these instant-fails exist: there needs to be some way to instill a sense of urgency and danger, especially since violence is such a core theme of the Game of Thrones. It’s a widely recognized way of heightening tension with mechanics. However, I don’t think it serves Game of Thrones well. There are other examples like The Walking Dead or Beyond: Two Souls that downplay mechanical failure and substitute in either an extremely convincing solution or supplant it with social consequences. What if failing a QTE changed your character model to look more beat up or resulted in the exclusion of certain NPCs? These are two basic suggestions but the point is that thematic drama can be just as stressful as the threat of a fail state. Finally, a word on adventure games: what does that term even mean anymore? Is the term even meaningful any more? 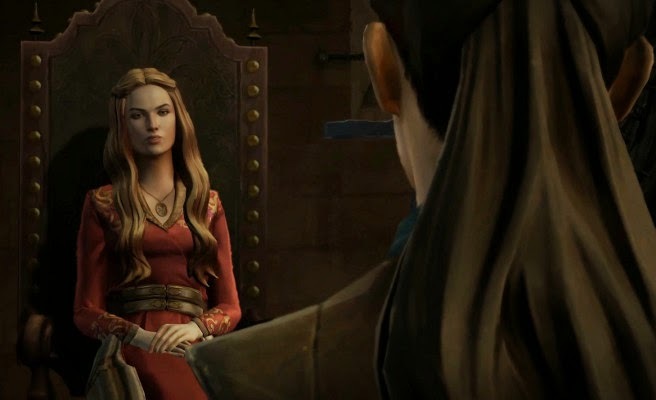 Is Game of Thrones even an adventure game? Are wacky puzzle and item combo games at all related to faux-medieval political intrigue simulators? We’re a long way from the Colossal Cave.